TNPSC VAO Exam Last date to apply online is changed to 31-12-2015 . For more details about VAO Exam 2015 Age Limit, Educational Qualification, Salary, Promotion, Syllabus for the examination etc. TNPSC Group 2A 2015 Exam Notification Published today (12-10-15) for 1, 863 vacancies. We can expect the TNPSC Group 4 2015 and VAO Exam 2015 notifications also to be published one by one soon. TNPSC Village Administrative Officers Exam is being a dream for lakhs of job seekers in Tamilnadu. The high respect and responsibilities given for Village Administrative Officers Post in our society is the main reason for this. Since, a candidate who completed merely SSLC / 10th can apply for the VAO Exam, any one with sincere preparation and hard work can easily win the examination. The VAO Exam 2015 Notification for about 800 plus vacancies is expected to be published soon - TNPSC Chairman Informed. Dear all VAO Aspirants, start your sincere preparation for the Village Officer Exam 2015 from today itself. Start your sincere preparation with Tamilnadu Samacheer Kalvi 6th to 10th books. Give more importance for General English / Pothu Tamil and Basic of Village Administration portions of TNPSC VAO Exam Syllabus. Set your aim to get your place in the 800 vacancies. If you study with well planned schedule and consistent hard work, nobody can stop your success. All the best ! 11-05-2015 : About 3000 VAO positions are Vacant in Tamilnadu - Tamilnadu Village Administrative Officers Association State General Secretary Informed. TNPSC VAO Exam 2014 First Phase Counselling completed, VAO Second Phase Counselling to be announced soon for 817 vacancies : TNPSC VAO Exam for the year 2013 - 2014 was conducted on June 2014 and the results were announced in the month of December 2014. Following the result the counselling was held. As on 13-2-2015, 1417 VAO's vacancies are filled by the counselling. For 817 remaining vacancies, the counselling is expected to be conducted in the TNPSC Office soon. The date for the next VAO counselling notification will be announced soon by the TNPSC . News Source : Tamil Hindu, 13-2-15. Important upcoming TNPSC Exams notification in February 2015. In the TNPSC Annual Planner 2015, the following TNPSC exams notifications are scheduled to be published in the month of February 2015. 30-01-2015 : TNPSC Annual Planner 2015 - 2016 published today. 28-01-2015 : TNPSC Group 1 2014 Preliminary Examination Result to be published with in one week, TNPSC Group 2 Result will be published with in 15 days - TNPSC Chairman informed. 22-12-2014 : TNPSC Group 4 Exam 2014 Result will be Published with in 2 months - TNPSC Chairman (Incharge) has informed. Read more. VAO Result 2014 is published by TNPSC. Check soon. 10-12-2014 : TNPSC has published notification for 33 Health Officer posts. The Exam will be conducted on 22-02-2015. The candidate can apply online from the www.tnpscexams.net website on or before 09-01-2015. Read more. 04-12-2014 : TNPSC Published Draughtsman Grade III Exam 2014 Result. The Result of Computer Based Test ( conducted on 03-05-2014 ) is announced by TNPSC now. The interview for the successful candidates will be conducted on 17-12-2014 at TNPSC Office, Chennai. Visit TNPSC's Official website http://www.tnpsc.gov.in/results.html for more information. 03-12-2014 : The results of TNPSC VAO Exam 2014 and Group 2A Exam will be published with in 15th December 2014. - During his visit at the TNPSC Assistant Conservator of Forest Examination Centre, the TNPSC Chairman Informed this today. So the result of Village Administrative Officer (VAO) and Group 2A Exams may be published at any time with in December 15th on TNPSC's Official Website www.tnpsc.gov.in . 27-11-2014 : Download Hall Ticket for the TNPSC Assistant Conservator of Forest Exam December 2014 from http://tnpscexams.net/ website. You may also read TNPSC Portal's Tips for Group 4 Preparation . 21-11-2014 : TNPSC Published Official Announcement for the Assistant Geologist Exam 2014 ( 1 - GT Post) Notification. 17-12-2014 is the last date to apply and the examination will be conducted in chennai on 01-02-2015 Read more . 19-11-2014 : TNPSC Group 2 Main Exam Results with in two months - TNPSC Chairman informed. News source , தி இந்து, page 6. 18-11-2014 : Upcoming TNPSC Online Exams may be like RRB Online Exam Pattern- Tamil Hindu News. TNPSC faced unexpected challenges in conducting Online Exam during TNPSC Group 2 Mains Exam (08-11-2014). Now it considers many alternatives over the present pattern of conducting online examinations. Todays Tamil Hindu Newspaper says that the Tamil Nadu Public Service Commission is considering to conduct the examinations in stages in different days with different question papers of same standard . The same system is now followed by Railway Recruitment Board Exams. 15-11-2014 : TNPSC may quit online mode of conducting exams in upcoming recruitments ? - Dinamalar News. Online Examination Pattern in TNPSC Examinations was initiated by former TNPSC Chairman Mr.Nataraj.IPS. Recently TNPSC has conducted the TNPSC Group 2 Main Exam in online mode. The exam was conducted more than 44 exam centres and attended by nearly 12000 candidates. In many examination centres, there were some problems in conducting examination due to power problem and server down.There was also re-exam on 09-11-2014 due to server problem in a Exam centre near Maraimalai Nagar. From the news report, it is conveyed that the TNPSC is considering not to conduct any more examinations in online mode in future. News source & courtesy - Dinamalar Newspaper. 13-11-2014 : TNPSC Group 2 Main Exam Answer Keys are Published in the TNPSC Website www.tnpsc.gov.in/answerkeys.html. Two answer keys are published for the 08-11-2014 exam and 09-11-2014 re-exam. Download the Answer Keys from the following direct link. 13-11-2014 : More than 10 Lakh Candidates applied for 4963 posts in TNPSC Group 4 Exam 2014 - Dinamani News. 08-11-2014 : TNPSC VAO Exam Results with in 3 - 4 weeks. -TNPSC Chairman Informed. TNPSC Chairman, while visiting the today's TNPSC Group 2 Mains Exam Centre, informed that the Results of the VAO Exam conducted on 14-06-2014 will be published with in 3 or 4 weeks. Thus the results of TNPSC VAO 2014 is expected to be published in the month of December 2014. 04-11-2014 : Download TNPSC Group 2 Mains Exam 2014 Hall Ticket (Exam date - 08-11-2014) from the TNPSC website http://tnpscexams.net/. Download it from the following direct link. Next most expected result notification from TNPSC in this November 2014 may be TNPSC VAO Exam 2014 Result . TNPSC has already informed on 26-08-2014 that the VAO Exam 2014 (14-06-2014) result will be published with in two months, now almost two months are already over, so we can expect the VAO Exam 2014 result with in this November 2014. If you are not confident with your cut off mark in the TNPSC VAO Exam 2014, and TNPSC Group 2A Exam 2014, don't worry, start your preparation for TNPSC Group 4 Exam 2014 immediately. Study sincerely, because you have only two months for the TNPSC Group 4 Exam 2014 Preparation. 29-10-2014 : Result of Oral Test (conducted on 28.10.2014) of Assistant Commissioner in the Tamilnadu HR and CE Administration Department is published in the TNPSC Website www.tnpsc.gov.in . 22-10-2014 : More than 12 Lakh applications are expected for this year TNPSC Group 4 Exam 2014. More than 3 lakhs applications in the first week itself. [Source : Today's Dinamalar Newspaper news. Read news] So the competition also expected to be very tough this year, speed up your preparation, try to complete all the syllabus portions with in November 2014 and do revision in December month. 21-10-2014 : Free Coaching for TNPSC Group 4 Exam 2014 by District Employment Office, Chennai. The classes will be commenced from November 2014. Timings 2pm to 6pm. Interested candidates can contact District Employment Office before 28-10-2014 with their TNPSC Group 4 Registration Number, Employment Card and SSLC Certificate . 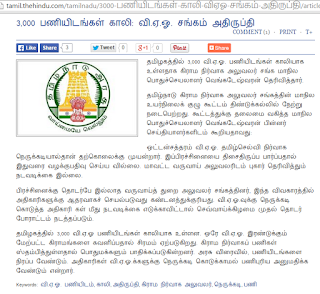 14-10-2014 : Happy News for all TNPSC Group 4 Exam 2014 Aspirants !!! TNPSC Group 4 Exam 2014 notification published today (14-10-2014) in the Dinathanthi Newspaper. This year TNPSC Group 4 Exam notification have vacancies for Junior Assistant, Bill Collector, Field Surveyor, Draughtsman, Typist, Steno-Typist Grade-III . Online notification also published in both Tamil and English languages in the TNPSC's Official Website http://www.tnpsc.gov.in/latest-notification.html . How to apply online for TNPSC Exams ? 12-10-2014 : More than 3000 VAO posts vacants in Tamilnadu. VAO Association State Secretary Mr.Venkateswaran informed. News Courtesy : Dinamalar. "So we can expect around 3000 vacancies in the upcoming TNPSC VAO Exam 2015 Announcement. Dear all TNPSC Exam aspirants, if you are not confident in TNPSC VAO Exam 2014 and Group 2A Exam 2014 results, don't worry, please start your preparation for this year TNPSC Group 4 Exam 2014 and next year VAO Exam 2015. All the best friends !" 11-10-2014 : TNPSC Group 4 Exam (25-08-2013) Counselling 4th phase announced. Presently announced counselling for Junior Assistant - IV Phase, Typist - III Phase and Steno - II Phase will be commenced on 29-10-2014. 10-10-2014 : TNSPSC VAO Exam 2011 (20.02.2011) reserve list 3rd Phase Counselling List published in the http://tnpsc.gov.in/counselling.html website. The counselling will be held on 27,28,29-10-2014. 10-10-2014 : TNPSC Scientific Assistant Grade II in the Tamilnadu Forensic Science Subordinate Service 2013 Exam Final Results Published in the TNPSC Website. http://tnpsc.gov.in/results.html . 09-10-2014 : TNPSCPortal is happy to launch Online Coaching for TNPSC Group 1, 2, 2A, 4, VAO and TNUSRB Police, Sub Inspector Exams . 07-10-2014 : Download Hall Ticket for TNPSC Statistical Inspector Exam 2014 ( Date of Exam : 11.10.2014)from http://tnpscexams.net/ website . 21-09-2014 : TNPSC Civil Judge Written Exam dates postponed . Previously TNPSC has notified that the written exams for TNPSC Civil Judge Exam will be conducted on 18-10-2014 and 19 - 10 -2014 . Now the exam dates have been postponed to 01-11-2014 and 02-11-2014 . 19-09-2014 :TNPSC announced notification for the recruitment of Assistant Conservator of Forests in Tamilnadu Forest Service Recruitment 2014 (Comes under TNPSC Combined Civil Services – I Group 1A Exam). Last date to apply online : 15.10.2014 Read more. 13-09-2014 : TNPSC started publishing all pending results one by one . Dinamalar News. 08-09-2014 : TNPSC Group 2 Preliminary Exam December 2013 Results Published. Check Soon. 02-09-2014 : TNPSC Departmental Exam December 2014 Announced. Apply soon. 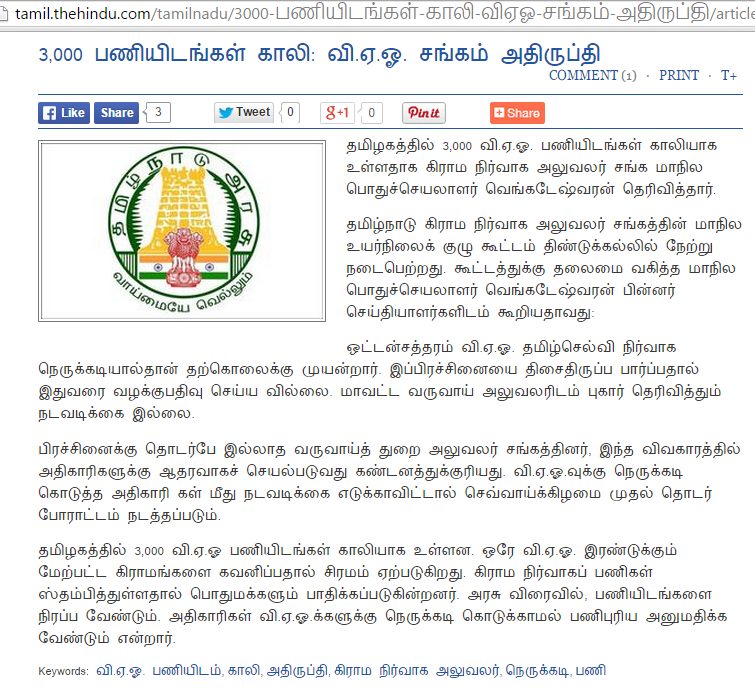 21-08-2014 : Tamil Hindu ( தி இந்து, 21-08-2014 ) News about TNPSC Group 2 Preliminary Exam December 2014 Results Delay. TNPSC made announcement for the TNPSC Group 2 Interview posts 2013 on 5.9.2013 . According to TNPSC 's Annual Planner 2014-2015, the results of the Group 2 Preliminary Exam had to be published in the month of February , 2014. Main Exam was to be conducted on May 2014 and the results was scheduled to be published on August 2014. 18-08-2014 : Next most expected upcoming exam announcement from TNPSC is the TNPSC Group 4 Exam 2014 . In the TNPSC Annual Planner for 2014-2015, the announcement for TNPSC Group 4 was scheduled in the first week of July 2014 and the Exam date was scheduled to be conducted on 19-10-2014. So we can expect the notification for TNPSC Group 4 exam 2014 soon. 16-08-2014 : TNPSC Group 4 Exam (conducted on 25.08.2013) Junior Assistant -3rd Phase, Typist -2nd Phase and Steno - 1st phase List of Register numbers of candidates called for Certificate Verification vs Counselling has been Published. The counselling for the above candidates is scheduled to be conducted from 18-08-2014 to 23-08-2014. 15-08-2014 : TNPSCPoral.In Visitors அனைவருக்கும் இனிய சுதந்திர தின வாழ்த்துக்கள் ! 14-08-2014 : TNPSC Departmental Exam May 2014 Results Published Check Soon at TNPSC's Official Website www.tnpsc.gov.in . 09-08-2014 : Good News for TNPSC VAO Exam 2014 - 2015 Aspirants ! Honourable Minister for Revenue Thiru R.B. Udhaya Kumar has informed in the Assembly that 2,944 VAO Vacancies to be filled this year. Dear all VAO Exam aspirants, start your preparation now itself. All the best ! 08-08-2014 : Final Result of Assistant Public Prosecutor , Grade II April 2013 Exam has been released today. Check soon. 07-08-2014 : There are two new results ( Government Data Centre Punch Operator and Block Health Statistician in Tamilnadu Medical Subordinate Services ) have been published on 01-08-2014 in the TNPSC 's official website www.tnpsc.gov.in . So next result is expected to be the most awaited TNPSC Group 2 Preliminary Exam December 2014 Result . 06-08-2014 : Assistant Medical Officer (Unani) Exam Mark Details of Written Examination and Oral Test is Published in the TNPSC Website www.tnpsc.gov.in . Check Soon. 04-08-2014 : TNPSC Group 2 Mains Exam Self Preparation Book List CLIC HERE 24-07-2014 : TNPSC Group 1 Official Answer Key of July 20th 2014 Exam has been published today. Check soon. 22-07-2014: TNPSC Portal's Group 1 July 2014 Exam Expected Cut Off Prediction CLICK HERE . 21-07-2014 : Now you can download TNPSC Group 1 Answer Keys of popular coaching centres like NR IAS Academy, Trichy and Radian IAS Academy, Chennai [ CLICK HERE to download ]. 11-07-2014 : TNPSC Group 1 Exam ( 20-07-2014 ) Hall Ticket / Admit Card Issued today. Download Soon. 03-07-2014 : TNPSC Group 2A Exam 29-06-2014 Official Answer Keys are published today at www.tnpsc.gov.in . You can download TNPSC Group 2 A official Answer Keys here. TNPSC Group 2 A Exam 2014 Results are expected in September or october 2014 . Note : If you can't download the answers keys from TNPSC website ( server error ) try with Radian IAS website from the following link. 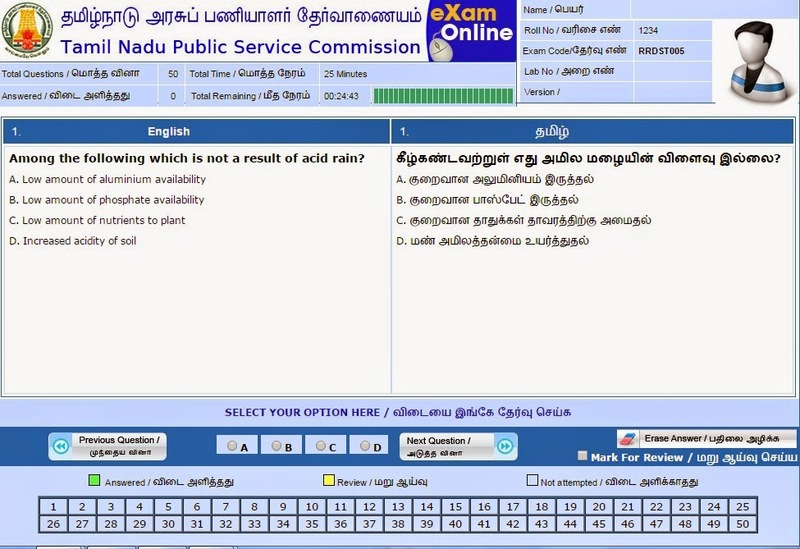 14-06-2014 : When TNPSC VAO Exam 2014 Answer Key ? TNPSC VAO Exam 2014 Expected Cut off Marks Soon. Dear TNPSC VAO Exam 2014 candidates. TNPSC Portal wishes you all the best ! Don't fear about the exam, go with what you studied, write the exam with confidence, sure you will win ! May GOD bless you all ! This is last minutes before the exam , if you have not downloaded the hall ticket, don't be tension, try your last chance to download it from a browsing centre near to your residence or your exam centre earlier. Be sure that you should be there in the exam centre before 9.30 AM. 03-06-2014 : TNPSC VAO Exam 2014 Hall Ticket has been Published . You can download your TNPSC VAO Hall Ticket from TNPSC's official websites www.tnpsc.gov.in or www.tnpscexams.net. You can download the VAO 2014 Hall Ticket from the following direct link also. 01-06-2014 : TNPSC VAO Hall Ticket for the June 2014 Exam is most probably expected to be published with in this week (First week of June 2014). How to download TNPSC VAO Hall Ticket ? This is a simple demonstration for the first time TNPSC VAO Exam candidates. You can visit www.tnpsc.gov.in or www.tnpscexams.net to download hall ticket for VAO Exam. Actually the direct link will be on www.tnpscexams.net website. There you will find a "Download Hall Ticket" link in the right side of Village Administrative Officer exam title. 21-05-2014 : Check TNPSC VAO Exam 2014 Application Status Online at the following link directly. Yesterday 20-05-2014 there was a rumour that "TNPSC has announced the hall ticket for VAO exam 2014" . But it was wrong information. In TNPSC website, it released the hall ticket for TNPSC Departmental Exams Only in the following link http://tnpsc.gov.in/DEHT-get_may2k14.html. So dear visitors , wait till the end of this month for TNPSC VAO Exam 2014 Hall Tickets download. 17-05-2014 : When will TNPSC issue TNPSC VAO Exam 2014 Hall Tickets ? . TNPSC usually publish the call letter for all group exams before two weeks or 10 days of the exam date. So we can download the TNPSC VAO Exam Hall Ticket from the TNPSC websites www.tnpscexams.net , www.tnpsc.gov.in in the last week of May 2014 or in the first week of June 2014. 02-04-2014 : 5 Lakhs candidates have applied for TNPSC VAO Exam till date, TNPSC expects more 5 Lakhs before last date of 15-04-2014. Source : Dinamalar Newspaper dt. 02.04.2014. 13-04-2014 : Many of the visitors have asked 'when will be TNPSC Vao Exam 2014 announcement ?'. According to TNPSC annual planner, the Village Administrative Officer Exam 2014 is scheduled to be announced in the second week of March 2014 and the exam would be held on 15-06-2014. As per the plan the TNPSC Group 4 Exam 2014 announcement is expected in this week. Any how we have to wait till the proper announcement from TNPSC. TNPSC Annual Planner inform there will be 2342 VAO vacancies this year the announcement for the TNPSC VAO Exam 2014 is scheduled to be published on 2nd week of March 2014. The TNPSC VAO Exam 2014 date will be 15-06-2014. The results will be published in the first week of September 2014.